Around 2:30 on January 6, 2014, the Clackamas County Sheriff’s Office requested Portland Mountain Rescue to assist in the search for a hiker missing in the vicinity of Zig Zag Mountain. The subject, Gary Tuor (age 71), his dog Buddy and Abel Caba (age 38) had been hiking on Sunday, January 5, near Devil’s Meadow. They were unable to return before nightfall and somehow became separated. Abel eventually managed to find his way back to the trailhead on Monday, although he was injured by a fall along the way. Gary and the dog, however, did not return. Gary’s wife contacted the sheriff’s office around noon on Monday to report them missing. She found their truck and Caba at the trailhead a short while later. Clackamas County Sheriff’s Office mobilized Pacific Northwest Search and Rescue, Search One K-9 and Portland Mountain Rescue to conduct a ground search of the area. The deputies also enlisted communications assistance from Mountain Wave and aerial searching by the National Guard (using FLIR technology). Initially the search area was large and poorly defined due to limited information about where Gary had last been seen. Around 5:30 p.m., however, the National Guard helicopter spotted a campfire near the top of Zig Zag Mountain ridge at around 4500 feet. A plan was quickly formed to dispatch two PMR teams to the location using different routes. Both teams deployed from Base at around 6:00 p.m. Based on conditions encountered in the field, however, both teams ended up following the same route. Well up the trail, they found tracks in the snow of a single hiker and a dog. They followed these tracks toward the reported location of the campfire. Meanwhile, the National Guard helicopter refueled and was back in the air using its search light to help guide the rescuers to the target. Around 8:00 p.m., the deputy deployed a third PMR team to approach the location along an old abandoned road now called Burnt Lake Trail and then bushwhack uphill toward the ridge. Around 9:30, all three PMR teams converged on the location and immediately found Gary and his dog. After gulping some hot drink and a snack, Gary and his Buddy hiked out with the PMR rescuers. They were all back safely at the trailhead around 1:30 a.m. on Tuesday, January 7. The subject was fortunate that conditions were clear (so aerial searching was possible) and dry (so he stayed reasonable dry). Conditions were dramatically different only 12 hours later, which could have significantly affected chances of survival. The subject was smart to use his lighter (his one piece of survival gear) to light a fire that provided warmth and signaled his position to the helicopter. A flashlight might have prevented Tuor and Caba from separating and becoming lost as darkness fell. PMR urges hikers to know their route and carry a map, compass and other navigation aids. We also urge all back country travelers to carry enough equipment to stay warm and dry through at least one night in case they are lost. 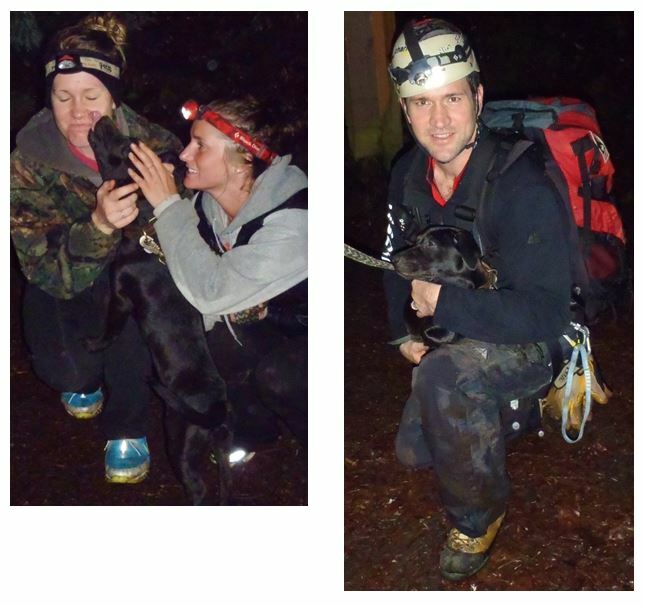 Around 3:30, PMR rescuers encountered a distraught dog owner on the trail near the falls. She reported that her dog Rocky had fallen off the cliff the day before. She and friends had returned Sunday to search for Rocky, but they could not get to the bottom of the cliffs, and Rocky was no longer barking. Assuming the worst, she was headed home. The rescuers proceeded to the overlook above the falls from which the dog had fallen and inspected the area from the tops of the cliffs by descending partway from the other side of the falls. Around 4:00, the deputy in charge concluded there was no human subject and terminated the mission. However, he gave PMR rescuers permission to continue on their own if they chose to do so. PMR elected to send one rescuer over the cliff as a training exercise. Five minutes later, a wriggling, yapping Rocky cheerfully greeted Scott Norton as he rappelled to a ledge halfway down the cliff. Rocky had fallen to the ledge and stayed their more than 24 hours, confident that his humans would come for him. Eventually overcoming Rocky’s resistance, Scott stuffed Rocky into his pack and closed it tight for the journey back up the cliff. Using a two-rope system, rescuers hauled Scott and Rocky back up the cliff where he was reunited with his tearful owner. Back at the trailhead, Rocky had a snack and passed out dog kisses to all the PMR rescuers. One rescuer commented that Rocky would probably forget the adventure by tomorrow, but would be terrified of backpacks for the rest of his life. Rocky’s owner says she’ll keep him on leash from now on. Happy holidays to all! Around 4:30 p.m., the Clackamas County Sheriff’s Office called Portland Mountain Rescue for assistance in rescuing the man and his dog. Around 6:00 p.m., a team consisting of PMR, two members of the AMR Reach and Treat Team, the Oregon Humane Society Rescue Team and a sheriff’s deputy deployed to the scene. A second PMR team was standing by at Timberline Lodge ready to carry rescue gear once the situation was fully assessed. When the first team reach the scene, four good Samaritans (with two more dogs) were on the trail watching over Ranger and his master, who were still stranded on the slope. PMR rigged a fixed line and a rappel rope. One of the AMR rescuers descended to Ranger and his master with harnesses. The man was secured to the fixed line and the rescuer put a harness on Ranger. The rescuers first raised Ranger to safety and then hoisted his master. Neither were injured. The team hiked back to Timberline Lodge using headlamps. All subjects and rescuers were out of the field by 9:00 p.m.
Portland Mountain Rescue encourages back country users to hike with a buddy. We also encourage dog owners to keep their dog on a leash, particularly in dangerous terrain. The Multnomah County Sheriff’s Office requested our assistance in a search for a possible suicide victim in the vicinity of the Vista House in the Columbia Gorge. The subject’s car had been parked in the area for several days. On the morning of July 30, 2011, PMR searchers descended from above to investigate colorful objects observed from above. They quickly located a woman’s body accompanied by a small dog. The PMR team packaged the body in a litter and used rope systems to haul it up a steep incline and finally a vertical section. The team then calmed and rescued the dog. All rescuers were out of the field by 13:00.